The InSinkErator F-2000 Replacement Water Filter Cartridge Plus (1-Pack) keeps your water tasting clean by reducing particulates, chlorine taste and odor plus cysts, lead, mercury, asbestos, benzene, atrazine, 2,4-D, Lindane, Carbofuran and p-Dichlorobenzene, allowing you to enjoy better-tasting hot beverages. 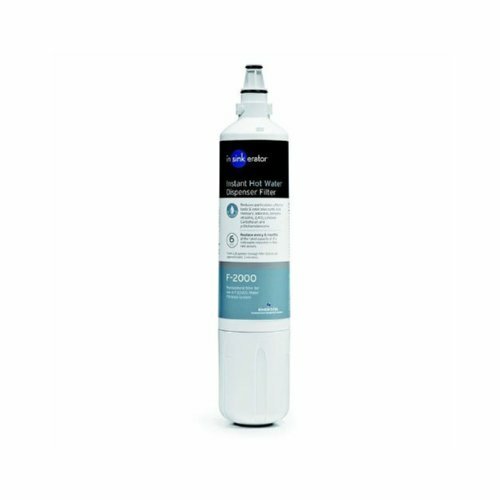 This under sink water filter is for use with the F-1000S and F-2000S Water Filtration System, designed specifically for InSinkErator Instant Hot Water Dispensers. This replacement water filter features a sanitary quick-change design to minimize contact with used filter material. The twist-and-lock design allows for quick-and-easy filter swaps. It automatically shuts water off when filter cartridge is replaced. The water filter is NSF standard 42 and 53 certified for quality assurance. The InSinkErator F-2000 replacement water filter is not compatible with the InSinkErator SST-FLTR Stainless Steel Tank and Filtration System. For optimal performance, InSinkErator recommends replacing your water filter cartridge every 6 months.